With padded covers, simple images, and an amazing range of novelty textures, Baby Touch and Feel books capture the attention of the very youngest children, and create an experience they'll want to repeat again and again. Who doesn't love puppies, kittens, and bunnies? 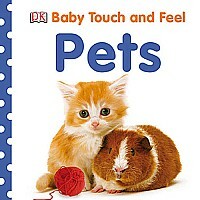 Baby Touch and Feel: Pets will delight your little ones, while teaching them about the animals they see every day.